ACME. is pleased to present a solo exhibition of new paintings and sculptures by Los Angeles based artist Iva Gueorguieva. Included in the exhibition is a new monumental painting that consists of 5 panels that wrap around a corner of the room, with one panel on the left wall and the other 4 panels continuing to the right wall forming an L-shape. Included with Gueorguieva's new paintings will be three new sculptural works that she produced during her ongoing residencies at Graphicstudio in Tampa, FL. Her collaged paintings, works on paper, and sculptures traverse a terrain that is both physically present and illusionistic. Gueorguieva first started experimenting with cutting and collaging the surfaces of her paintings in order to explore the shallow yet real space produced by the cut and the glued edge. Subsequently, the two-dimensional space transitioned into the three-dimensional space, and the artist proceeded to create armatures that could support the fragments of painted and printed images. The "bodies" for the sculptures are made of found metal scraps, each suggesting a very specific mood and space, and therefore calling for a specific color and image. Gueorguieva then created etching and litho plates for each structure, generating appropriate collage materials that were then draped over the metal and the thin layers of epoxy clay. The surfaces were further complicated by meticulous painting on top of the collage material, blurring the line between the real, sculptural space and the perceived spaces produced by the painted mark. Iva Gueorguieva (b. 1974, Bulgaria) received an MFA from the Tyler School of Art in Philadelphia. Recent solo shows include Samsøn, Boston, MA; Ameringer | McEnery | Yohe, New York, NY; Stefan Roepke Gallery, Cologne, Germany; Susanne Vielmetter Los Angeles Projects, LA, CA; Bravin Lee Programs, New York, NY; LUX Art Institute, Encinitas, CA; Angles Gallery, Los Angeles, CA; Stichting Outline, Amsterdam, Netherlands; Pomona Museum of Art, Claremont, CA. Notable group shows among others include the Contemporary Art Museum at USF, Tampa, FL; Galerie Lelong, New York, NY; Pasadena Museum of Art, Pasadena, CA; Dunn and Brown Contemporary, Dallas, TX. Her work is included in many public and private collections including the Los Angeles County Museum of Art, the Minneapolis Institute of Art, and The Museum of Contemporary Art, Los Angeles. She is the recipient of the California Community Foundation mid-career fellowship for 2010 and the Pollock-Krasner Grant for 2006. Her work is represented by ACME. 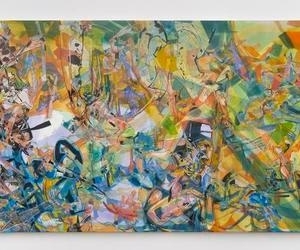 in Los Angeles and Ameringer| McEnery | Yohe in New York.